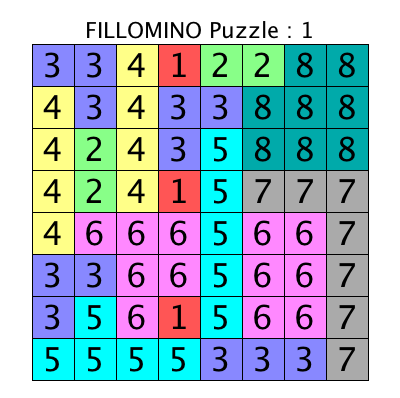 A Fillomino puzzle consists of a square grid in which some of the squares contain a single digit number. To complete the puzzle, a Solver must place numbers in the blank squares so that the puzzle is divided into zones with the area of each zone equal to the number contained within its squares. The zones may take on any shape, but zones having the same area may not touch each other. Each puzzle has a unique solution which does no require any guesswork to achieve. 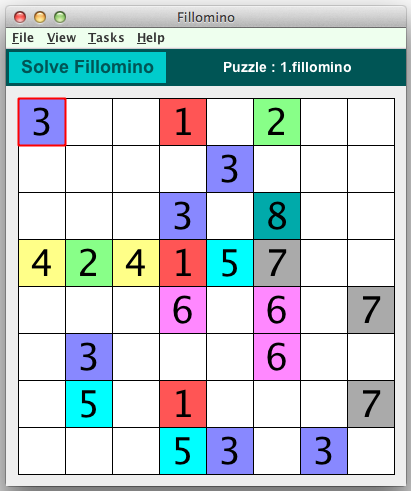 The following graphics show a Fillomino puzzle in the Crossword Express Solve screen and a PNG graphic file produced by the program's print function, showing the complete puzzle solution. See also a full size version of a PDF file showing a completed solution. Fully automatic construction of puzzles. Puzzle sizes can range from a minimum of 4x4 up to a maximum of 8x8.